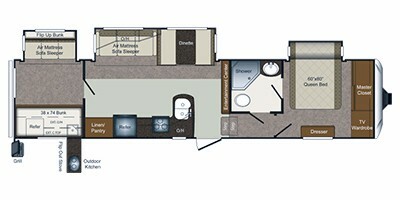 FEELING NEARLY NEW, THIS BUNKHOUSE FIFTH WHEEL FEATURES A GREAT BUNK AREA WITH HIDE-A-BED SOFA AND 2 BUNKS WITH LOADS OF STORAGE. ADD TO THAT THE OUTSIDE KITCHEN, AND THIS JUST MAY BE THE ONE YOU HAVE BEEN WAITING FOR! APPROX. DRY WEIGHT: 10,600 LBS.